For most families, the kitchen is the heart of the home and a place for the family to hang out together. That’s why it’s important to find the right style to suit your lifestyle and tastes. Today we take a quick look at three distinct kitchen styles: modern, contemporary, and industrial. The following kitchen is a spectacular portrayal of a functional space and encompasses a variety of popular design trends. The kitchen perimeter cabinets are maple and the color is Oyster. The island and great room cabinets are also maple and the color is Smokey Hills with Onyx Glaze. 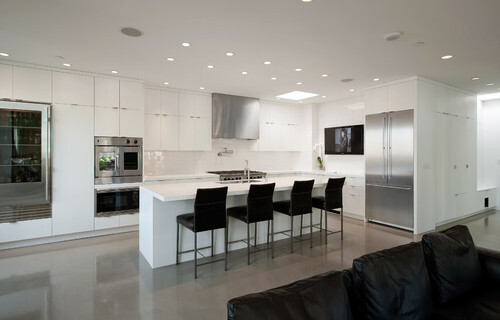 The Omega cabinets, hardware, and under cabinet lighting were supplied and installed by the Parr Cabinet Design Center. Our #ParrCabinet experts fill us in on what trends we can expect to see in 2016. Check out the Real Cost Finder tool from Houzz. The tool gives estimates of potential costs of remodeling projects. It is powered by data from a survey of more than 100,000 homeowners in over 50 metro areas. With the tool, homeowners can research real costs for completed projects gathered from homeowners in their area ranging from high-end to modest, for virtually every space inside and outside their home. Guess what feature is at the top of home buyers’ most wanted list? It’s energy-star rated appliances. According to the NAHB Economics Group, 94% of home buyers want energy-star rated appliances. Guess what feature is at the bottom of home buyers’ least wanted list? An elevator! If you are planning on remodeling your home in the near future, there are things you should consider before the project starts. The following is a list of eleven things you should expect during a home remodel. It’s not easy deciding on a kitchen finish, is it? The selection process is complicated and there isn’t a set of rules for selecting materials and finishes. But that doesn’t mean you can’t follow the general guidelines below when you’re ready for a kitchen remodel. Going Greige? Here’s why you should.